Looking for an easy to make takeaway favor that guests will really love? One that's adorable, affordable, and unforgettable? Check out how to make this cute foam sheet basket with delicate cutouts that's adorned with a darling Bowdabra bow! 2 Plastic cups - 3 1/2" x 2 1/2"
Cut a 9" circle out of foam sheet. Place circle between two sheets of parchment paper and iron on medium heat until flexible. Quickly take the foam circle and place evenly over the top of one cup. Immediately press second cup over foam and press foam and cup down into first cup. While foam is still warm, edges of foam circle can be further shaped or curled out. Foam cup shape will quickly cool off and can easily be removed. Add a decorative trim on the edge using a punch. Glue on a strip of ribbon around the cup . . .
and on a foam sheet strip for the handle. Begin making a Bowdabra bow by cutting 18" of bow wire, folding in half. Place the folded wire in the Mini Bowdabra, tucking the ends underneath. You'll have a loop at one end and two loose pieces at the opposite end. Next, dovetail the ribbon by folding the end together and cut at an angle. Press the ribbon tail in the Mini Bowdabra, folding and twisting, right side down for the first loop. Fold and twist and press down for second loop. Continue folding and twisting to make three loops on each side. Cut ribbon for a matching dovetail. Scrunch ribbon down with the Mini Bowdabra wand. Put wire ends through loop while the bow is still in the Mini Bowdabra and pull tightly. Gently pull the bow out of the Mini Bowdabra and tie wire in knot to the back. Fluff and straighten bow and glue onto the center of ribbon on cup. An adhesive decorative stone can be added to cover the wire. Fill the basket with your favorite goodies, treats or small gifts. Do you have an idea for a Bowdabra Bow wedding creation? I'm part of the Bowdabra design team and love creating projects that includes a Bowdabra bow! "Everything is better with a bow!" 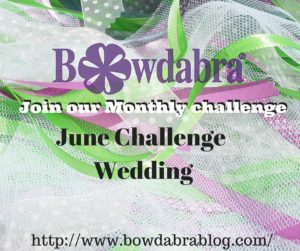 Enter here for the first Bowdabra Monthly Challenge and have the chance to win a fabulous ribbon prize package! OOoh arent these simply adorable !!! And you were brave enough to punch foam with a Martha Stewart punch!!!! That is so cute Gail! I love that you punched the edges....really finishes your basket off! I am going to have to try this foam one day. Very clever and so pretty. Perfect for little favors. Love the idea of punching the edges. It really adds some elegance to the project. I will have to check out your Bowabra, Have a great week. This is adorable. I had no idea you could do that with foam. Would punching the edges be easier to do before making the box shape? Thanks, Mel! Yes, it is a bit easier but it didn't look as nice. I originally cut out two 9" circles from the foam sheet. One, I punched out the edge first and then ironed it and placed it over the cup. But when I inserted the other cup to make the shape, it went down further and the wavy shape didn't look as nice. So I went with punching after making the cup shape for the second circle. It looked so much better. I concluded that the cut out circle needed to be larger than 9 inches to punch it out first for the size cup boxes that I used. Gail, what a cute idea! You always have the cutest crafts! This is so pretty, Gail. Your crafts are always so creative! Thanks for joining us this week at Social Boost Monday. I love the foam reshaping! That's super clever and of course now I want to get my hands on some foam to give it a try.